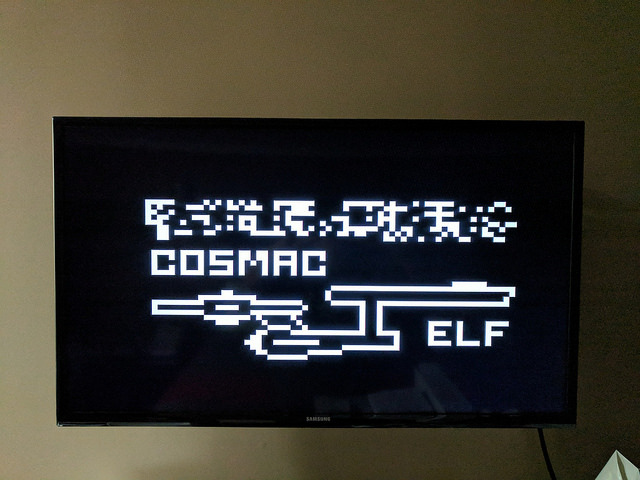 FPGA-Elf actually running PIXIE graphics demo | What's All This Brouhaha? The difference is that now it’s being generated by the 1802 program (seen in the top 1/4 of the bitmap) actually running, whereas before it was hard-coded into the frame buffer memory to test the output half of my VHDL code. It’s possible that my 1802 core isn’t executing some instruction correctly, though it worked well enough to run a number of Forth programs on CamelForth. I’ll debug this using a VHDL simulator to capture a trace of my hardware design from reset to the completion of the first video frame, and a logic analyzer to capture the same from the electrical signals of the Elf II for comparison.